I eat way too much. In fact I just got back from the dentist today who informed me I have a crap load of cavities that will have to be filled. He joked that the cavities must have been from me enjoying too much food. He's probably right about that though. Anyways today's post is on Japanese food. It's no secret that I love Japanese food. 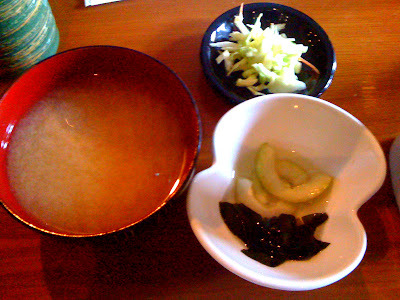 Authentic or not, Japanese food is just awesome. If I had to live off one type of food for the rest of my life, it would hands down be Japanese for sure. Today's post in going to be on 2 different Japanese restaurants that I love. With Japanese food, you really get what you pay for so here are two recommendations that have good food without being too too expensive or too cheap where you feel like you are eating sushi from Ralph's. 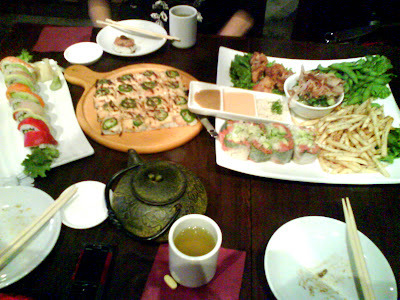 Stop 1: Tokyo Table located at 400 South Baldwin Ave. Arcadia, 91007. There are 3 Tokyo Table locations but the one in Arcadia is the best. There was one Beverly Hills before that closed and their food could not measure up to the one in Arcadia. Neither could the Irvine location. The Arcadia location just has a lot more food choices and better food in general. Tokyo Table serves fusion Japanese food and they are delicious. They have some interesting specialty dishes. 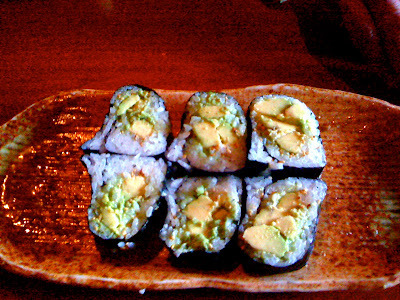 They have the typical rolls which are really good as well. Their sushi pizza is so tasty. It's in thing with the jalapeno peppers on it in the picture above. It's literally a party in your mouth. On the right side is another Tokyo Table favorite of mine called the tuna summer roll. It looks and tastes like a Vietnamese spring roll but much more delicious. Right above that is their chicken karaage that comes in a really good delicious tartar sauce. My other favorites at Tokyo Table are their raw tuna/albacore sashimi that you ccook by yourself on a mini grill and their garlic shrimp rice the comes sizzling in a stone pot. I don't have pictures of the last 2 dishes I mentioned because they are so good that I'm done eating before I remember to take a picture. If I had to narrow down what to order at Tokyo Table down to a few dishes it would be: Garlic Shrimp Rice, Spicy Tuna Summer Roll, and Sushi Pizza. Go try it. You can do no wrong. They also have an interesting array of drinks. Lychee sake, mango martinis, passion fruit iced tea, etc. No matter what you order though, make sure you leave room for dessert. Their honey toast is the best! 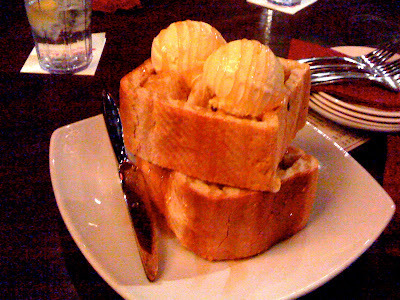 You can't see it very well in this picture but they use Japanese fatty toast and cut up the bread, dip it in honey, and add ice cream on top. If it's your "birthday" you get it for free! *hint hint* I love Tokyo Table so much it's almost embarrassing. I have a frequent customer card, which doesn't give me any discounts but if I accumulate $500 within one year then I get a discount. I also get $20 off a meal during my birthday month. I know you must be thinking who the hell can eat $500 to get the big discount? Uh, if I weren't in Hong Kong for like 3 months a year I would have. I made it up to over $400 before it cut off! Just go here! Ask for a card. Get $20 and tell them it's your birthday! The best part is it's located in the Santa Anita Mall so you can shop and walk off all that food after! Toro's is located 500 West Main St. Alhambra, 91801. I've driven past this place so many times without even considering going in. From the outside, it looks like a typical Chinese owned Sushi Joint with cheap sushi. It is on Main Street though which is a better area than Valley so I was always curious to try this place out. My friend told me about this amazing place called Toro's and to my surprise after I looked it up, I realized it was the same place. Okay, so first off this place isn't really fusion food. It's just plain Japanese. I don't know why they call it fusion. The only thing fusion about it is that it's Chinese owned and otherwise completely Japanese run. This place is famous for their Omakase aka "chef's choice." I wasn't really in the mood for spending that amount of money for lunch though, plus I was eating with my mom that day who was vegetarian for the day so we opted just to just do lunch. Plus, I kind of had an amazing omakase last time with Sasabune so I didn't want to ruin that experience. I know it's Japanese run and just Chinese owned but I like my Japanese stuff 100% Japanese. 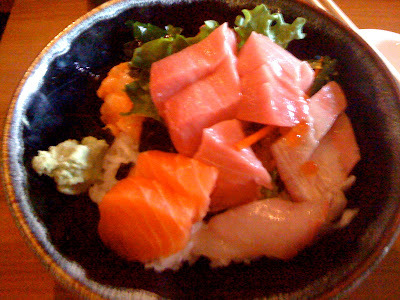 I ordered their amazing Chirashi special, which was only $14.95. This is what comes with their lunch specials. I gave it to my mom since she sadly had to watch me eat yummy fish while she only could eat veggies for the day. See I do have a heart. When I first saw their Chirashi, I wasn't really impressed. Here's the Chirashi I had in Hong Kong. Then again nothing can compare to Hong Kong other than being in Japan of course. Then after I took a bite, it was delicious. I would say it's about the same quality of the one I have in HK. It's a good deal I suppose for being $14.95 and for using fish flown first class from Japan each day. Here's my mom's very sad vegetarian order of avocado roll. Either way both Tokyo Table and Toro's are worth checking out. Tokyo Table is good whenever, but I would personally only recommend Toro's for their cheaper lunch specials. I don't feel like they are worth it even though their fish quality is good. Jan 25 Okonomiyaki! Time for Japanese Pancake!